Ilam district is one of the seventy-five districts of Nepal, The district, with the town of Ilam as its district headquarters, covers an area of 1,703 km² and has a population (2001) of 282,806. Ilam stretches from the Terai belt to the upper hilly belt of this Himalayan nation. Ilam quietly sets about its business in making a name for itself internationally through its quality tea. Ilam is a small hilly town situated at Mahabharata range in the eastern part of Nepal decorated with pristine landscapes. Sloped tea states, dense natural forest, pilgrimage spots and unique cultures are the highlight of this place. Ilam is situated at the height of 610 meters to 3669 meters above sea level and its area is 17039 Sq Km. This city is famous for tea production and internal tourism. Students, corporate groups, couples and individuals are visit tea gardens of Ilam Nepal each year for sightseeing, trekking, picnic, pilgrimage and other tourism activities. The number of Foreign travellers from around the word increasing these days; It is an excellent place to see main travel destinations are Mai Pokhari, Shreeantu, Sandakpur, Siddhithumka, Gajurmukhi, Kanyam, Fikkal, Mai Beni, Sano Pathibhara and Tea Gardens etc. Sandakpur located at the edge of Nepal India border 3636 meters above sea level. Sandakpur offers impressive mountain views of Mount Kanchenjunga, Makalu and Everest. To go to this best viewpoint one can drive from Ilam bazaar to Maimajhuwa via Maipokhari then trek to Sandakpur takes 5 to 6 hrs. Situated in the far east of Nepal, 90km from the border at Kakarbhitta, Ilam is a pleasingly pretty town of timbered green buildings, and a walk through the small clusters of green tea plants that carpet the surrounding hills will take you to one of the most tranquil spots in the Terai. A concrete walkway leads through the tea fields up the hill to what locals quaintly call a 'viewing point' but what is actually a large mirrored tower block that from a distance looks like a bad hotel! Otherwise, there are many other paths you can wander along. Ilam is today famous in the world for tea production. Its ILAM TEA is very famous and is exported to many parts of Europe. The main source of income in this district is tea, cardamom, milk, ginger, Churpi, Amliso and potato. This place also has a religious importance. The Devi temples have a great importance attached to them and many people come here just for pilgrimage. The major attraction of Ilam is the 9-cornered Mai Pokhari lake. Also known as the abode of the goddess lots of tourists as well as Nepalese people come to visit this lake. Mai river and its four tributaries also emerge in Ilam district. The famous Mane Bhanjyang (Mane pass) connects Ilam with Darjeeling district of West Bengal, India. Ilam is the Far eastern district of the country which is inhabited by people of different culture, Nature living together peacefully. Illam is located in the foothills of Mount Kanchanjunga. 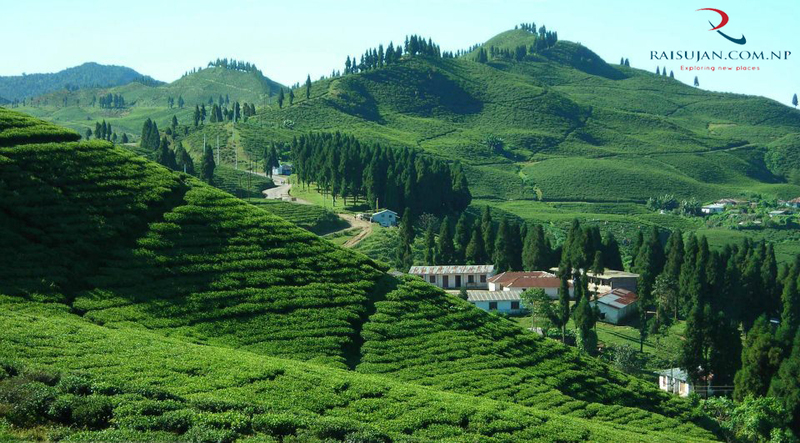 We can find the large land of lush-green tea gardens in Illam and the rolling hills covered with tea leaves are simply Wonderful. Greenery is all over the hills of Illam all around the year. Illam Tea Garden is situated near Illam Bazaar and Kanyam Tea Garden located between Terai plain and Ilam Bazaar are the major of Nepal. There are many places for trekking in Illam and these places give us feeling of Relaxation and enjoyment. It is about 600 km from Kathmandu. Chiyabari cottage is bamboo cottage lies at the highest altitude of Ilam Bazaar. 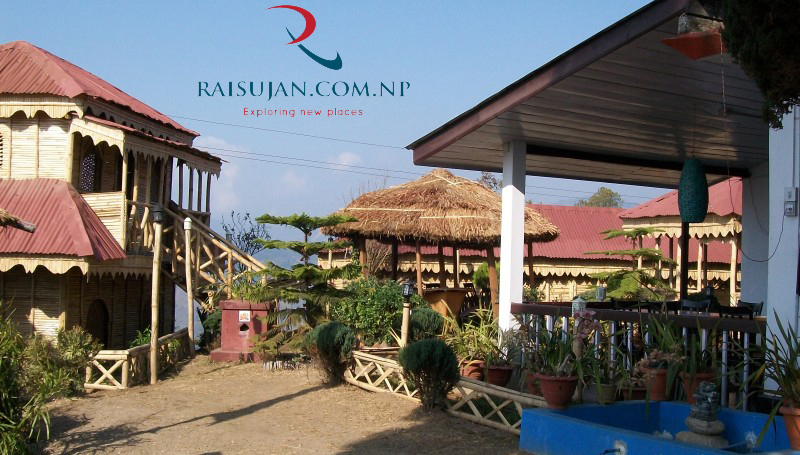 It is a family running the guest house, providing its best quality services in the field of hospitality trade in Ilam. Since we established we make it one of the best hotel in Ilam. It has well-appointed rooms which are all clean, comfortable, well furnished with its surrounding, panoramic magnificent views of hills and tea garden. It can be seen from the room as well as from our rooftop & cottage view varanda. With the hospitality within its tradition, you will definitely fell homely, friendly environment at our place along with the smiling respective, helpful & sincere staff members who always fell happy to be at your service & take good care of you which makes you feel "home away from home." we have a beautiful garden with different types of orchid flower, where you can relax, enjoy your just one day of staying in this cottage, you feel like you are staying and spending your vacation on big and expensive star hotel. Antu Danda: It is situated at an altitude of 1677m in Illam District. It is famous for its unique views of Everest and Kanchanjunga.It is the best point for viewing sunrise and sunset. There is a motorable road from Illam to Chhipitar .This Trekking along green hills take 3 hours. Kanyam and Fikkal: These places have large tea land and these tea plantation areas are famous among tourists for picnicking.sightseeing and taking photographs. Chhintapu: It is the second highest peak in Illam district. The area has rich forests of Rhododendron, medicinal plants and various species if the birds. We can find about 11 types of Rhododendron in this area.Yarcha gumba and rare animals like red panda and musk deer are also can be seen in this area. The peak cab can be reached by trekking for 4 hours from Illam Bazaar. Gajur Mukhi: It is on the banks of Deumai Khola which is west of Illam.